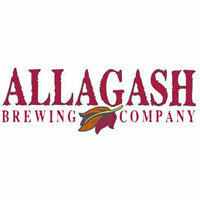 To learn more about Allagash Brewing Co. and their Dubbel style ale. This could be the best yam recipe I've ever made and ever eat'en! In a large pot or Dutch-oven, add the cinnamon sticks, cloves, star anise pod and place over medium heat. Let the pot warm, slowly toasting the spices and helping them release their essential oils. 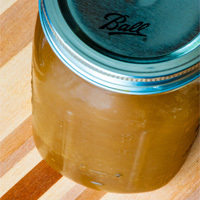 When the pot begins to have a wonderful aroma, add the citrus zest, then the honey. The honey will start to bubble, with the hot pot. Add the rock candy and nutmeg, then add the Dubbel, leaving behind any sediment, if present. Add the citrus juice and vanilla beans, then bring the syrup to a boil and cook for 8 minutes, stirring a few times, making sure all the sugar dissolves. Add the prepared yams and cover the pot with a lid and turn the heat to low. Let the yams cook slowly, stirring a few times, preventing the bottom of the pan from burning. 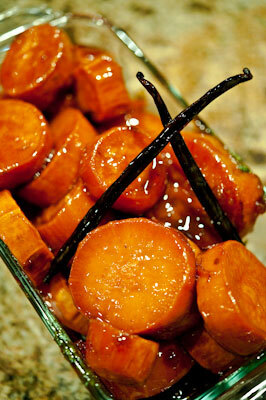 After 30-40 minutes the syrup should be thick, glossy and the yams fully cooked (fork tender). 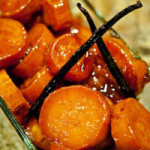 Transfer the candied yams to a serving dish and serve immediately or keep warm until ready to serve. To make this dish vegan, replace the honey with maple syrup. Wow Sean, this looks fabulous! I am absolutely adding this to my Thanksgiving menu. It does not say when to add the vanilla beans. Thanks Ryan, The recipe is fixed.